You like pineapple on a pizza. To get your view across, you decide to write a blog on it. However, to me, the more reasonable pizza lover, the idea of wrecking a cheesy delight with some fruit is such an abominable act and I decided to write another blog that goes against yours. In my blog, I provide a link to yours so that people can see the atrocities and the disturbing nature of your approach to edibles. However, search engines do not care about pizzas. It just knows that my blog provides a link to yours. Meanwhile, I start getting more links to my blog from authentic and rational pizza lovers across the internet. This, in turn, increases the value of the link that I have provided to you. These links from one website to another are called Backlinks. Backlinking is basically conversations between websites. A website’s prestige on a search engine is hugely impacted by backlinks. Earning valuable backlinks is a crucial element of off-page SEO. By valuable, I mean backlinks from trustworthy websites that have a high Domain Authority. Earlier, it was easy to build up backlinks because even the low-quality links counted. However, after Google rolled out its Penguin algorithm update, the entire terrain has undergone a rigorous quality-check and is now much more sophisticated. Backlinks are now monitored to be relevant and contextual to your niche. 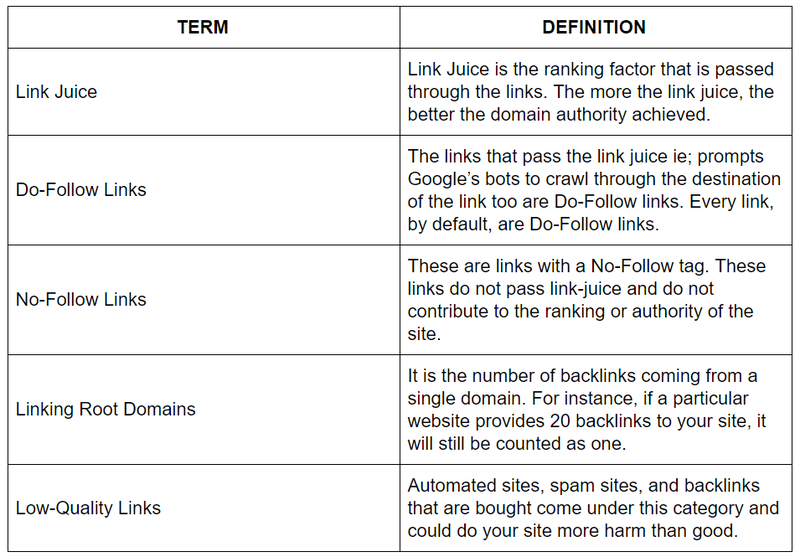 Let us now go through a glossary of basic terms related to backlinking. Now that we are familiar with what backlinks are, let us look into some of its advantages. Organic ranking is affected primarily by backlinks. Organic links from trustworthy sites will move your website to a higher pedestal of credibility thus making you rank better. If your site is relatively new, garnering backlinks will make it easier for the search engine bots to find and crawl your website thus making indexing easier and faster. The greatest benefit, however, is the massive referral traffic. Getting a single backlink from a website of sizeable follower base will do wonders to your traffic. Long term presence. The World Wide Web is a huge data repository that only grows with time. If you manage to obtain a considerable amount of high-quality links over time, it will benefit your way into the future too. Imagine your business sold books and you received a number of quality backlinks from book reviewers and other retailers. 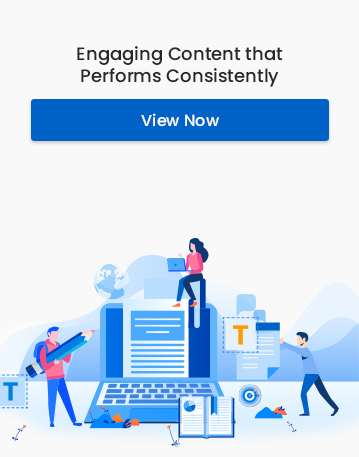 For years, users looking for good books to purchase and its reviews will come in contact with your link and will ultimately arrive at your landing page. Brand Authority. Along with the SEO centric Domain Authority, backlinking helps in optimizing your Brand Authority too. Simple association of your brand to the referral sites and topics will be extremely beneficial for your brand’s authority and credibility among consumers. Now that we have established that unlike backlinking, pineapple on pizza is a bad idea, let us look at how we can gain valuable backlinks. I will familiarize you with 11 effective methods to gain backlinks. This includes 10 good ideas and 1 supercalifragilisticexpialidocious idea. Volunteer to guest post on other blogs. Find out blogs relevant to your niche, make sure these are do-follow blogs and then comment on it. Discover threads that are contextually relevant to your business niche on well-known forums and paste a link in it. Make proper use of discussion boards such as Quora. Ask and answer questions related to your site on platforms such as Yahoo Answers. Exchange links with other relevant bloggers. Agree to disagree. Augment an argument. Write controversial stuff. Run a campaign or a contest and give away free products. However, make linking to your site an inevitability in order to receive such products or promotions. Proclaim authority in your niche and get the media’s attention. Brian Dean’s dotingly designated “Moving Man Method”. Also known as “broken link building”, this is a sure shot backlink earning formula with the advantage of being quick to deliver results. The technique is to find websites in your niche and hope that they have broken links scattered around. You can then contact the owner of the website and inform them of the broken link. Further, seduce them with relevant content that you have already prepared and then ask for a backlink. Authority of the website. Higher the domain authority, stronger the backlink. Link quality. Consider third-party metrics like Ahrefs, Majestic and Moz to determine the quality if the website and the links they provide. Traffic to the website which provides the link. Focus on the standard of their editorials. Think of backlinks as Unobtanium from Avatar found on Pandora. The harder it is to get, the more valuable it is. 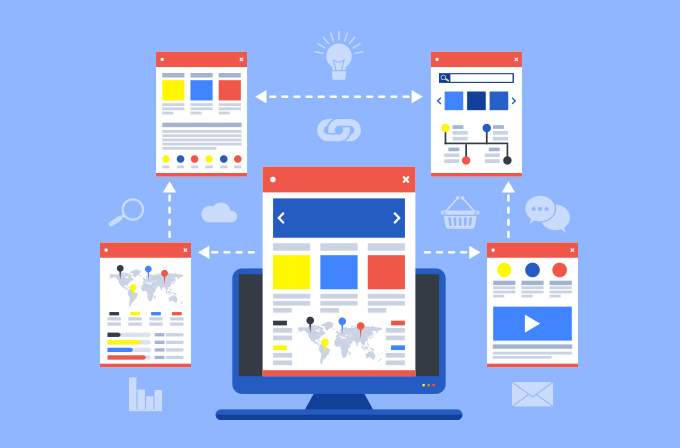 Getting your site indexed and easier to find is one of the outcomes of strong backlinking. So, make sure whoever is providing you the links are indexed otherwise, it is pointless.